One of my favorite lessons in one of my undergraduate real estate finance classes was around the ‘Winner’s Curse’. While you can read a more detailed explanation here http://en.wikipedia.org/wiki/Winner’s_curse, the basic premise is the winner in an auction will ‘win’ at the expense of overpaying. Our professor allowed the class to bid on a glass jar of pennies. The higher bidder would buy the jar of pennies at the bid price. The highest bidder bid and paid $24.00 for a jar with…$12.00 of pennies. He won, but he lost because he overpaid. My professor explained that in a large auction with many bidders, it is almost inevitable that there will be one (if not multiple) over-eager bidders that would offer too much and jack up the price. This example is easy to see the actual dollar difference — the worth of the pennies were only temporarily hidden because we could not count them. In reality, purchasing assets can lead to a slightly confusing exchange simply because the true worth of the assets are unknown. While we can value the asset based on com parables or on cash-flow, it’s always a little unknown. If you are a seller, maximize on bids to maximize your selling price. If you are a buyer, beware of buying when there are many other buyers. 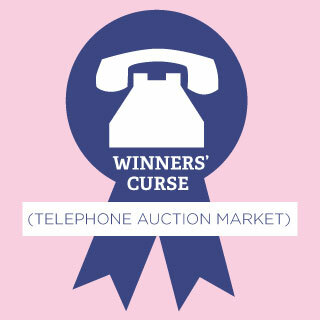 My little brother and I previously looked at antique telephones’(1) bid vs price to see if there was a clear correlation with increased price with increased bids. This time, we took the bidding a step further and looked at the difference between ending price and starting price. The logic behind this analysis is that the “true” worth of the product may be defined by the seller. 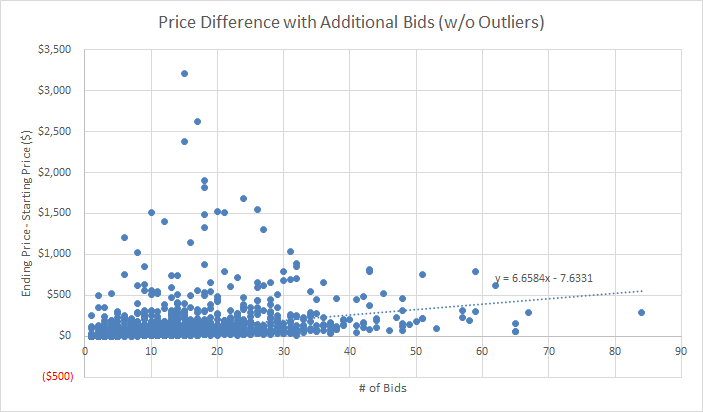 We could then isolate the influence of extra bids’ role in raising prices above the “true value.” While the trend, as a whole, showed a positive price increase with more bids, the difference only showed $7.07 increase per bid and the difference w/o outliers showed a $6.65 increase per bid. The data continues to be messy likely because even within the antique telephone bucket, there is a very wide discrepancy of product quality. My little brother explained that on certain years, only a very limited number of some models were made. Some of those models would be worth thousands of dollars, while more common ones would be less than $10. Additionally, the starting price may not be a truly sufficient indicator of what the seller believes the product is worth. A common Ebay tactic is to start at an obnoxiously low price, lure in many bidders, and let the bidders bid the price up to a much higher price. 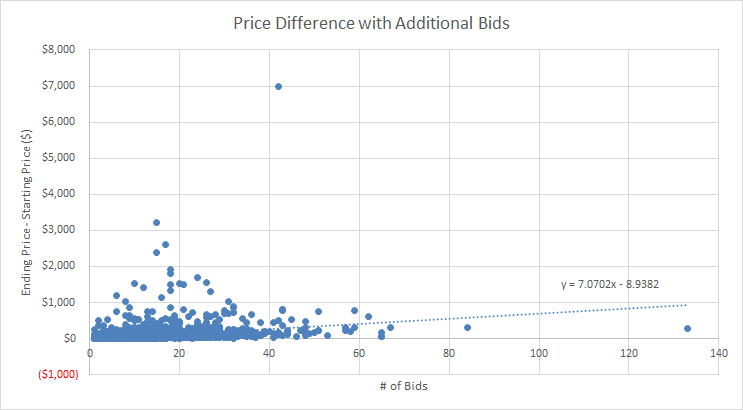 While the takeaways are clear (if you are a seller, increase bidders; if you are a buyer, be slightly cautious of more bids), this data shows that bids alone are not sufficient in setting price. (1) Kenton is an active collector of antique telephones (www.kentonkwok.com) so naturally, he had an interest in understanding buying and selling patterns in this market.